Note: Please park on the North side of the quonset hut style hangar. If flight operations are being conducted from the south end of the runway, walk along the left side of the runway to the south end. Be very cautious when gliders or tow planes are moving near you. Clubhouse phone is (757) 357-3948; answered only on weekends. Pass Nansemond-Suffolk Academy (playing fields and school buildings) on left. At 3rd stoplight, Right turn on Lake Prince Drive 604. Through trees and over the lake on new causeway. Ignore 606 Exeter Rd on the left and small residential streets. After approx 3 miles, next “big” intersection is 605 Milners Rd, (new national cemetery on right) street signs on right - turn Left. Follow through deforested area to intersection with 603. Straight after stop sign (605 name changes to Murphy Mill), cross another small lake and into open farm country. 605 tee’s into Orbit Rd. 609. Turn right and a short distance later are several houses and a closed country store. Turn left on 605 Iron Mine Springs Rd.. Short distance on left to gliderport (big white building with red-roof). Park in lot behind shiny, silver, half-round hangar. Road tees at stoplight. Turn Left – south – on 32/10. Approx 4 miles; church on right and houses, 600 Oliver Drive pops up on right. Turn on it. 600 tees (stop sign) and seems to end at 602 and a farm. Turn Right, go 100 yards and 600 continues on left. 600 merges with 653 (head left at stop sign). Stay on 600 Woodland Drive as 654 goes left. Past open fields and into forests, pass church and over water, to stop sign (Woodland Methodist church on right), go Left on 637 Orbit Rd. Barn and closed country store. Turn right on 605 Iron Mine Springs Rd. Short distance on left to gliderport (big white building with red-roof). I-95 South through Petersburg to Exit 46. I-295 North. I-295's Exit 3 onto U.S. 460 East toward Norfolk. Cross swamp and thru small residential area (please slow down; they’re our neighbors), pass three long chicken barns on left. Airfield and windsock visible on left. At group of houses and closed country store, turn left on 605 Iron Mine Springs Rd. Short distance on left to gliderport (big white building with red-roof). 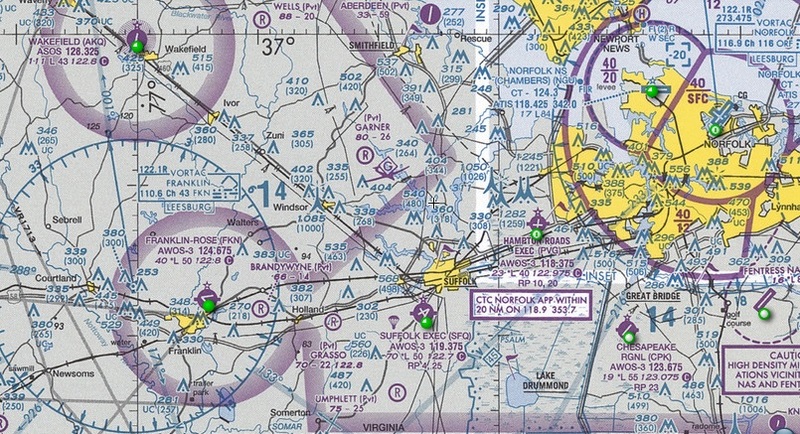 Note: 3VA8 is a Private Airfield. The turf conditions vary and we appreciate your not getting stuck in the mud (or crops). Please call on the radio on 123.3 and request permission to land. If you are not acknowledged and provided with further instructions, then you DO NOT HAVE PERMISSION TO LAND. Close to Drive intersection (L-27 LoAlt chart). Under approach corridor to KPHF—heads up! Upper Vee of reservoir a landmark as are three long silver chicken barns. Red-roofed and silver-dome hangars at north end. Windsocks on hangar and midfield. 2600 feet of turf. Caution: south 1/3 can get soggy from rain. Runways called north and south; actually 02 and 20. Power-planes fly downwind leg to west for noise abatement. Gliders have right of way.